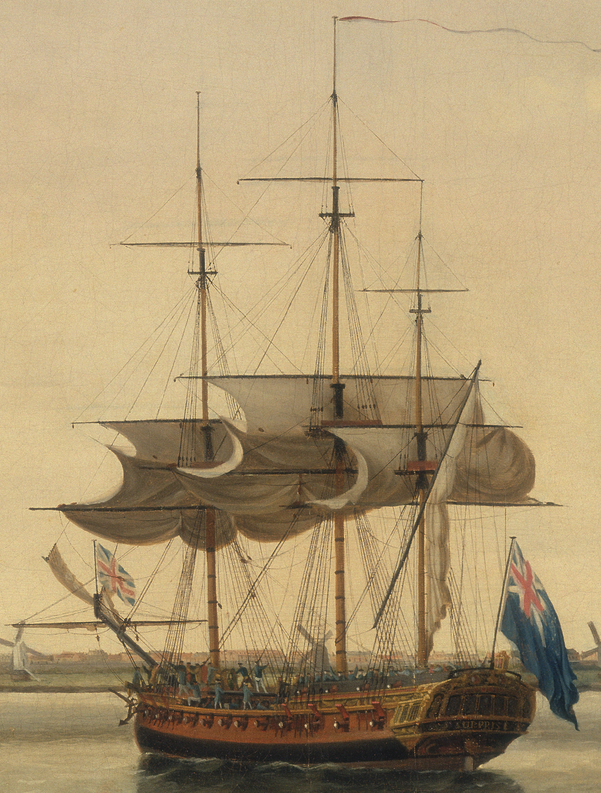 The Frigate Surprise at Anchor off Great Yarmouth, Francis Holman, 1774, Yale Center for British Art. Holman's painting strikes home for me. Not just because of the great series of novels by Patrick O'Brien that feature the HMS Surprise as an important vessel in its stories, nor just because of the wonderful nautical film Master and Commander: The Far Side of the World. I spent years working for the museum that currently possesses the ship used in the film: the frigate Surprise. It, along with the fleet of other historic and recreated vessels, was a second home to me. If you ever have the chance, go to the Maritime Museum of San Diego. It's a great way to spend a day! Thankfully for us, the excellent online collection of the Yale Center for British Art has an amazingly detailed "zoom" feature on their website. The images I post here will be lower resolution, so I really encourage you to go to their website and take a look through their displays. The detail is astounding! Under the larboard guns of the Surprise is a longboat with a few oarsmen and a coxswain. Their jackets are a variety of colors: light and dark brown, blue, and what might be black or a very dark brown or blue. The coxswain has a blue waistcoat and may even be wearing a brown frock coat. He, along with the forward-most oarsmen, wears a round hat with with upturned brim. The other two oarsmen wear cocked hats with the point forward. Interestingly, the oarsman with the brown jacket and cocked hat wears a queue. Heeling a touch to her starboard as she sails by the stern of the Surprise is the sloop Yarmouth. An officer or gentleman stands on her larboard rail with hands cupped over his mouth, presumably calling out to the frigate. At the stern rail stands another fellow in frock coat and cocked hat, but beside him is a tar at the helm. Our helmsman wears a blue short jacket, white trousers, and what appears to be a round hat. Further forward and amidships is his shipmate in the same set of slop clothes. There is a lad in a red jacket, but it is difficult to determine who precisely he is. Sailor? Officer? Passenger? There is too little detail to say much of anything about him. Rowing away is a small boat with two oarsmen and a coxswain. All of them wear brown short jackets, though the coxswain is distinguished from the others by his round hat, while they wear cocked hats. Press Gang Week starts tomorrow! Wrong Surprise though! L'Unite wasn't captured by the RN until after this picture was painted.